Publisher: This study consists of: A concise historical review: Jews Fighting for Poland's Independence. Lists of Jews who served as officers in the Polish Armed Forces. 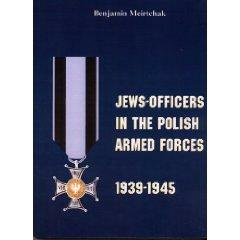 List #1: Jews-Officers in the Polish Army--September 1939; List #2: Jews-Officers in the Polish Armed Forces in Exile; List #3: Jews-Officers in the Polish Peoples Army; List #4: Jewesses-Officers in the Polish Peoples Army.--Author's Introduction, p. vi.The book is based on materials of the Central Military Archives (C.A.W.) in Rembertow-Warsaw, Institute Polski-Museum Sikorskiego in London, Jewish Historical Institute in Warsaw, the Yad-Vashem Archives in Jerusalem and a number of private archives.--P. iii.Includes bibliographical references.. This study consists of: A concise historical review: Jews Fighting for Poland's Independence. Lists of Jews who served as officers in the Polish Armed Forces. List #1: Jews-Officers in the Polish Army--September 1939; List #2: Jews-Officers in the Polish Armed Forces in Exile; List #3: Jews-Officers in the Polish Peoples Army; List #4: Jewesses-Officers in the Polish Peoples Army.--Author's Introduction, p. vi.The book is based on materials of the Central Military Archives (C.A.W.) in Rembertow-Warsaw, Institute Polski-Museum Sikorskiego in London, Jewish Historical Institute in Warsaw, the Yad-Vashem Archives in Jerusalem and a number of private archives.--P. iii.Includes bibliographical references. The Free Books Online service executes searching for the e-book "Jews-officers in the Polish armed forces, 1939-1945" to provide you with the opportunity to download it for free. Click the appropriate button to start searching the book to get it in the format you are interested in.